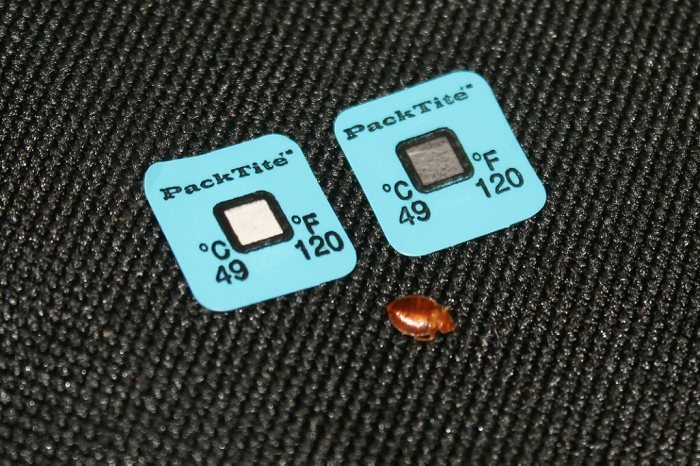 ThermaSpot Heat Sensors by PackTite are a convenience new tool used during heat treatments to ensure items treated reach 120° F (where all life stages of bed bugs are killed). This can be very helpful when treating personal items inside the PackTite heater as you can simply place the sensor in the innermost section of the items treated. Once the heat treatment cycle is completed, the sensor can be inspected to see if it indeed reached the proper temperature. Each sensor can only be used one time as once the indicator changes from white to black indicating it reached 120° F. it will remain black. The fact that it stays black is convenient as it can be inspected at any time after the treatment. The sensors are also relatively inexpensive and can also be used effectively in full home heat treatments to ensure different parts of the home have reached 120° F.
(1). Great for checking dryer temps just stick on clothes and check after load is done. (2). Great for checking temps inside of books. (3). Irreversible - so even hours after your treatment/dryer cycle has cooled off you can tell if they reached kill temps. (4). Great way to check on whole house thermal treatments, just place some inside before your treatment is done. Q: Can the ThermaSpot Temperature Sensor be used alone? What heats up the sensor? The ThermaSpot is not intended to be used alone, but with a portable bed bug heater to monitor the internal temperature. We haven't tested the ThermaSpot in a dryer, but any home dryer in good working condition should exceed 120 degrees on medium or high heat settings. Reviewed by: Stephanie gaines from 363 n boardway apt 215 Joliet ILLINOIS 69435.